On Tuesday, after Rosh Hashana services, NHL and I began having a discussion. As our talk wandered from Rosh Hashana to Yom Kippur, I told NHL that the purpose of Yom Kippur was to apologize for our transgressions. However, I informed him that saying you are sorry wasn’t enough. If you were truly sorry, you wouldn’t repeat your misdeeds. I gave him the example of a bully I had back in middle school. This bully claimed to be my best friend. He even acted the part much of the time. Then, he would begin to mock me, stab me in the back (literally, he used a sharpened pencil), and would torment me in various ways. After awhile, he apologized. He claimed that someone had told him that I had said nasty things about him. Being extremely naïve, I took him back as a friend and everything was fine for awhile until he tormented me again. The pattern repeated itself over and over. Tormenting, apology, naive-younger-me refusing to believe that his one friend was really not a friend at all. Finally, I couldn’t deny it any longer and I refused to accept any more apologies from him. I finally realized how worthless his apologies were. Recently, NickMom has raised some folks’ ire. Amy, aka ResourcefulMommy, has a good summary of what happened. Short version: NickMom rips off HowToBeADad. NickMom is caught and apologizes. Then, NickMom is found to be stealing more content. Including photos of peoples’ kids. Including photos of peoples’ kids with the watermarks covered over by NickMom. They apologize again and take it down. They even issue a blanket statement that they’ll take down any content that the creators complain about. Here’s the problem, though. Their apology means nothing. Of course, they’ll take down the stolen content when people complain about it. If they don’t, they face copyright infringement fees of $750 – $150,000 per incident. However, they have shown absolutely no willingness to stop the copying in the first place. They know that their editors are lifting content and yet they just stay the course. Without even the slightest bit of effort to change their ways, their apologies mean nothing at all. 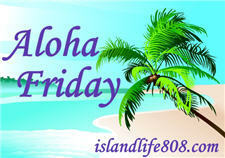 My Aloha Friday question for today is: How do you handle an insincere apology? Disclaimer: The "burglar" image above is by tzunghaor and is available through OpenClipArt.org. I’m just now hearing about all the blog content lifting that is going on. There are some very good blog writers out here so it only stands to reason that those who are not talented writers will lift that content and claim it as their own. Very sad. On another note, for me an insincere apology is just that. Insincere. I learn from it and cut ties with the other person if I can. If it’s a family member, I just make it my plan to stay well away from them. Menopausal New Mom recently posted..Aloha Friday – How Late Is Too Late to Call? Can’t dwell on insincere apologies or the people they come from – I just try to move forward! Happy Friday! Nancy @ Ollie McKay’s recently posted..Aloha Friday Fans! There isn’t really a whole lot that is worth doing to someone who has done it. 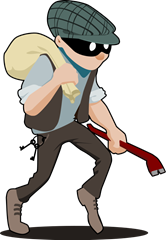 I remember once visiting a blog who had content stolen from it and as a last resort, the blog owner published all kinds of personal information that she could find online on the person. Like his phone number and mailing address. There is a blogger out there who has ‘borrowed’ my image from my more popular site. I know it was ‘borrowed’ because I opened up the image file and changed the eye color. I just figure that person looks stupid and it looks obviously ‘borrowed’ to others. Harriet recently posted..Marge Simpson in Glamour?